FIPCO forms have been accepted as standard by bank regulatory agencies, attorneys and the Wisconsin judiciary. In conjunction with legal counsel, these forms are developed and reviewed by our Drafting Team, helping to ensure compliance with State and Federal regulations. Over 430 forms relating to consumer, real estate, commercial, agricultural and municipal loans; deposit accounts; safe deposit boxes; and deposit and operations are available. 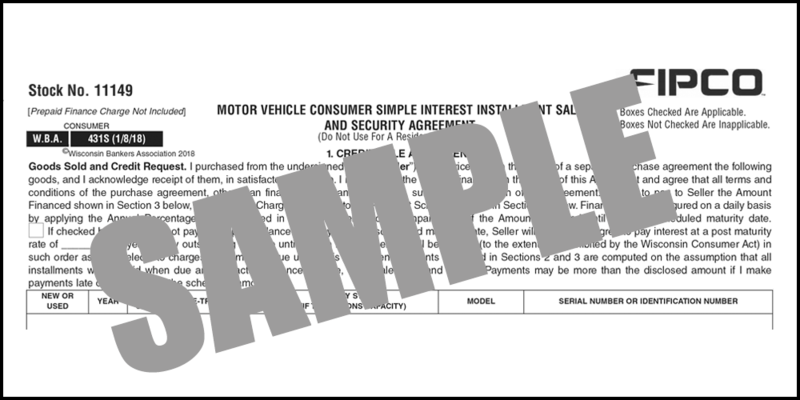 Forms are purchased by financial institutions, dealerships, attorneys and realtors. FIPCO routinely updates the form images in conjunction with all necessary regulatory changes, compliance issues and form enhancements. Updates contain the form files, as well as the text and document files that provide the supplemental Hard Copy Form Instructions. These instructions can be printed in Notepad, Microsoft® Word or Corel® Word Perfect. For added user convenience, all updates to form images can be delivered electronically. Flexibility - The customer may print blank forms as well as completed ones. Cost Efficient - Eliminates the expense of maintaining a Hard Copy Forms inventory. Compliance - FIPCO forms have been accepted as standard by bank regulatory agencies, attorneys and the Wisconsin judiciary. In conjunction with legal counsel, these forms are developed and reviewed by the Drafting Team, helping to ensure compliance with state and federal regulations. WBA consumer forms have been approved by the Department of Financial Institutions and as such are deemed in compliance with the Wisconsin Consumer Act. Adobe PDF - A blank copy of the form can be printed for manual completion, or information can be entered in blank areas. Adobe Acrobat Reader is a requirement for utilizing this format and can be downloaded at no charge from the Adobe web site. Click here for a complete list of our WBA Forms. FIPCO's Forms Department can assist you regarding what forms are available electronically. As a reminder, most forms produced by vendors are covered by copyright. This includes forms produced by Financial Institution Products Corporation® (FIPCO). Reproduction of a form protected by copyright, by any means or method, is a violation of law unless the form producer holding the copyright provides express permission for the form to be reproduced. In order to maintain the protections copyright affords, violations are pursued by the form producer and can be quite costly to the person or entity committing the violation. Thus, users of forms must not reproduce forms by any means unless permitted to do so by the producer of the form. Please contact the FIPCO Forms Department at 800-722-3498 for more information regarding FIPCO'S Electronic Forms. Fields marked with * are required; vendor forms protected by copyright. Forms must be ordered in multiples of 20 (unless Class PA). Forms are in "packages" of 100. Enter the quantity (number) of forms you desire. You have reached the limit for this order.